It's always surprised me when people, especially technical people, say they don't know Markdown. Do you not use GitHub? Stack Overflow? Reddit? I get that an average person may not understand how Markdown is based on simple old-school plaintext ASCII typing conventions. Like when you're *really* excited about something, you naturally put asterisks around it, and Markdown makes that automagically italic. But how can we expect them to know that, if they grew up with wizzy-wig editors where the only way to make italic is to click a toolbar button, like an animal? I am not advocating for WYSIWYG here. While there's certainly more than one way to make italic, I personally don't like invisible formatting tags and I find that WYSIWYG is more like WYCSYCG in practice. It's dangerous to be dependent on these invisible formatting codes you can't control. And they're especially bad if you ever plan to care about differences, revisions, and edit history. That's why I like to teach people simple, visible formatting codes. This makes coding our editor kind of hellishly complex, but it means that for you, the user, whatever markup language you're used to will probably "just work" on any Discourse site you happen to encounter in the future. But BBCode and HTML are supported mostly as bridges. What we view as our primary markup format, and what we want people to learn to use, is Markdown. However, one thing I have really struggled with is that there isn't any single great place to refer people to with a simple walkthrough and explanation of Markdown. 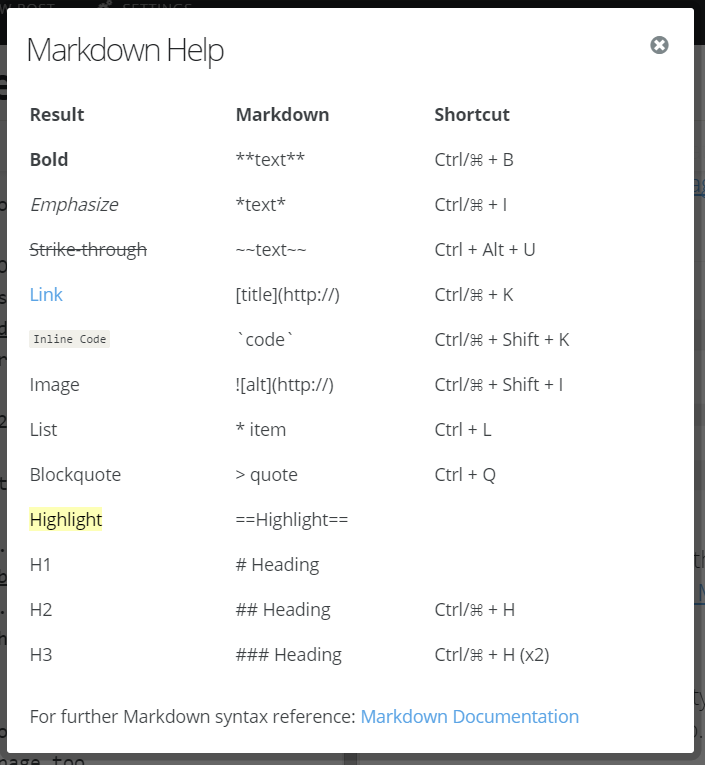 It's just OK. And GitHub has their Markdown Basics, and GitHub Flavored Markdown help pages. They're OK. 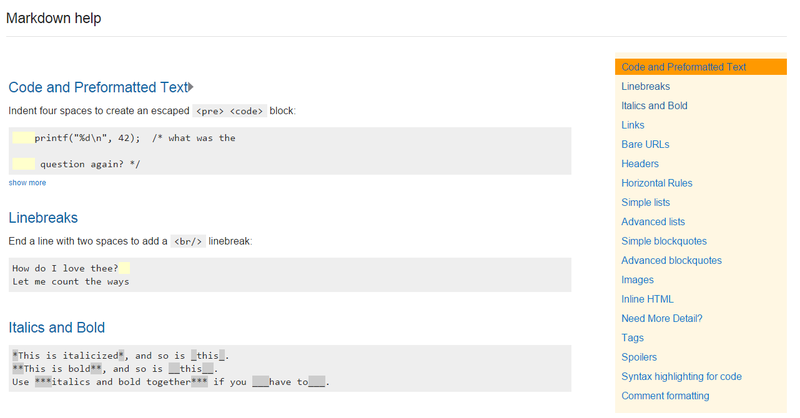 The Ghost editor I am typing this in has an OK Markdown help page too. But none of these are great. What we really need is a great Markdown tutorial and reference page, one that we can refer anyone to, anywhere in the world, from someone who barely touches computers to the hardest of hard-core coders. I don't want to build another one for these kinds of help pages for Discourse, I want to build one for everyone. Since it is for everyone, I want to involve everyone. And by everyone, I mean you. After writing about Our Programs Are Fun To Use – which I just updated with a bunch of great examples contributed in the comments, so go check that out even if you read it already – I am inspired by the idea that we can make a fun, interactive Markdown tutorial together. So here's what I propose: a small contest to build an interactive Markdown tutorial and reference, which we will eventually host at the home page of commonmark.org, and can be freely mirrored anywhere in the world. A gentle, interactive tutorial for absolute beginners who are asking "what the heck does Markdown even mean?" A dynamic, interactive reference for intermediates and experts who are asking more advanced usage questions, like "how do I make code inside a list, or a list inside a list?" There's a lot of variance in Markdown implementations, so teach the most common parts of Markdown, and cover the optional / less common variations either in the advanced reference areas or in extra bonus sections. People do love their tables and footnotes! We recommend using a CommonMark compatible implementation, but it is not a requirement. We'll run this contest for a period of one month, from today until April 28th, 2015. If you want privacy, you can mail your entries to me directly (see the about page here for my email address), or if you are comfortable with posting your contest entry in public, I'll create a topic on talk.commonmark for you to post links and gather feedback. Leaving your entry in the comments on this article is also OK.
We desperately need a great place that we can send everyone to learn Markdown, and we need your help to build it. Let's give this a shot. Surprise and amaze us!